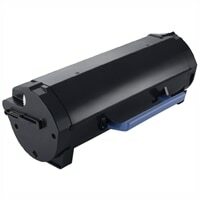 Dell B2360d&dn/B3460dn/B3465dnf 2,500-Pages Black Toner Cartridge Use & ReturnThe 2,500-Page Use and Return Toner Cartridge from Dell is designed to work with Dell Monochrome Laser Printers. It produces high resolution printouts with impressively sharp images and text. This black cartridge features a yield of up to 2,500 pages. Use and Return helps assure environmentally sound recycling of used toner cartridges. The 2,500-Page Use and Return Toner Cartridge from Dell is designed to work with Dell Monochrome Laser Printers. It produces high resolution printouts with impressively sharp images and text. This black cartridge features a yield of up to 2,500 pages. Use and Return helps assure environmentally sound recycling of used toner cartridges.